Advantages of the subway Everyone loves the Moscow subway (Moscow Metro), and there’s a reason for that. 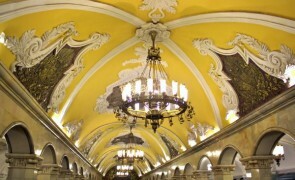 It is fast and reliable, its structure is clear-cut, and many of its stations look like palaces or museum halls. Traffic jams are left behind on the surface, trains come every two minutes, and it’s hard to get lost because there are so many direction signs: Just follow the color of your line….